If you’re not into K-indie music you may have never heard of Tearliner, but if you’re a K-drama fan–chances are you’ve heard his music. Tearliner actually started out as a six member band in January of 2004, but before the release of its first album, the group turned into a duo and then a one man band. Tearliner, who also just goes by Liner, born Park Sung-hoon, was never classically trained and doesn’t even read sheet music. His music is influenced by everything he has experienced in life and is classified by some as “Dream Pop,” because his music has a dream-like quality to it. My first exposure to Tearliner, that I knew of, happened right here on Seoulbeats through an article that I wrote. The article from back in September of 2010 was about the SungKyunKwan Scandal OST and included my lament over it not containing my favorite bit of background music from one of my favorite scenes. Other than his own works, Tearliner included the music of several other K-indie bands on the Coffee Prince OST like Humming Urban Stereo. The Melody, Casker, Misty Blue, Belle Epoque, and Donawhale. Due to his skillful use of music within the drama, fans of the drama also fell in love with its music. 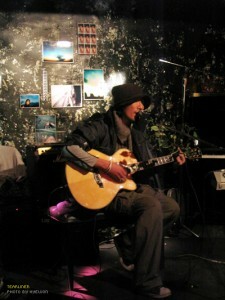 There was a noticeable surge in interest and popularity of K-indie music after the run of the Coffee Prince which many attribute to Tearliner. He has also worked on the music for the K-dramas Romantic Island and Triple. Here’s a couple of my favorites of Tearliner’s works. Music is like an oil painting on a canvas. Rhythm is the sea with smooth waves, instruments fill the air with a softening atmosphere, and melody is a ballerina dancing beautifully on the sea. Hope you’ve enjoyed being introduced to Tearliner and his music.